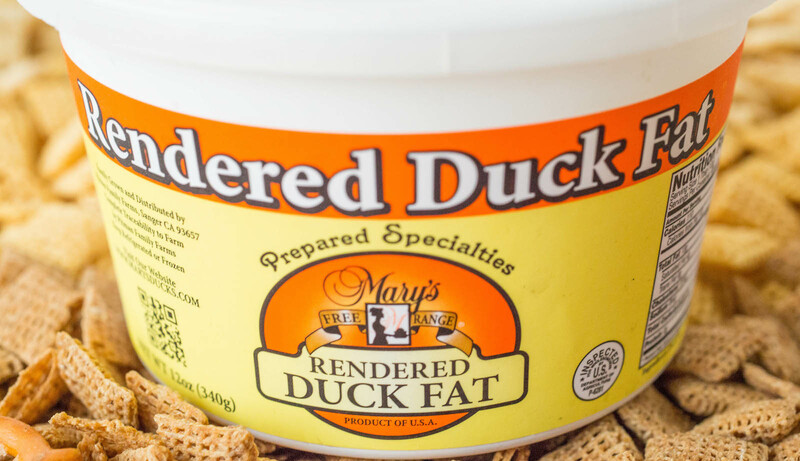 If you don’t know about duck fat, you’re really missing out! Duck fat is super rich with flavor, even more so than bacon. When used for frying, it gives food a beautiful golden brown color. It’s especially amazing when used with potatoes. My local grocery store always has it in stock, but if yours does not carry it you can buy duck fat here. 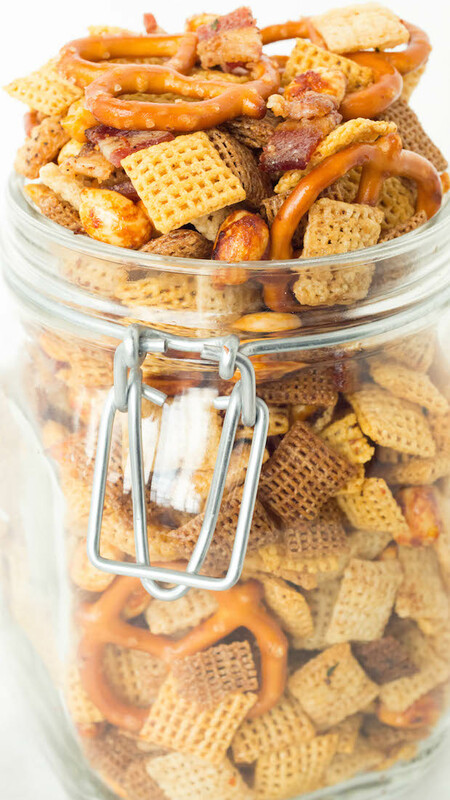 This Duck Fat Chex Mix was invented by Jake Godby of San Francisco’s Humphry Slocombe ice cream shop. 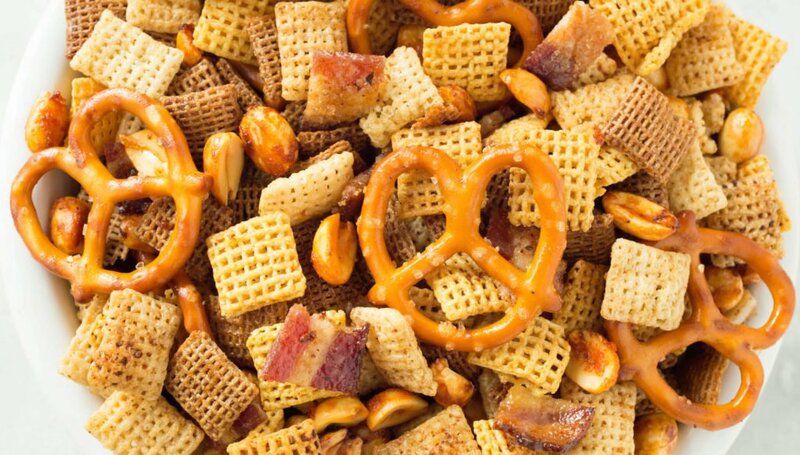 It’s tough to take something so classic, like chex mix, and improve upon it, but Goldby really hit the nail on the head with this recipe. I made my version of Duck Fat Chex Mix a little different. 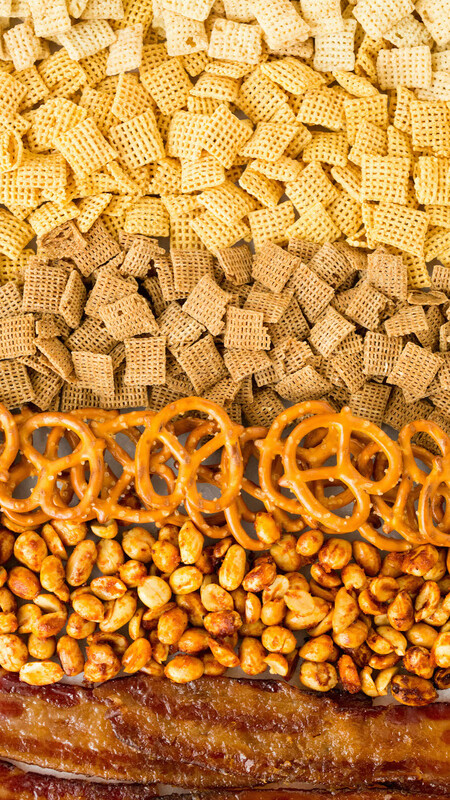 First of all, I think that any good snack mix should include components that are sweet, salty, savory, and spicy. The salty & savory is already there with the duck fat and chex, I just had to add the rest. We’re Sriracha lover’s, so I decided to use that for the spicy. I took some peanuts and roasted them in with the sriracha and a few other spices. They turned out even better than expected and it was very hard not to eat all of them while preparing the rest of the chex mix. Rather than bake the chex mix in the oven, I decided to try it in the crockpot. I love my crockpot so much. Sometimes it’s too hot in LA and I don’t want to turn the oven on for a snack. The crockpot is my best friend in these situations. Janette and I both really really liked this version of chex mix. It’s bursting with flavor. I took some to my family on a recent trip home to Florida and it was a big hit with all of them as well. If you’re looking to spice up your standard chex mix recipe, I do not think you will be disappointed in this duck fat version. Spray a baking sheet with non-stick spray. (I also cover my baking sheet in foil for easy clean up). In a medium bowl, combine olive oil, Sriracha, salt, garlic powder, cayenne pepper, and salt. Add in peanuts and gently stir until peanuts are covered. Dump peanuts on to the baking sheet and arrange in a single layer. Bake for 12-15 minutes. Allow to cool then set aside. Wrap a baking sheet with foil and place a wire baking rack on top (make sure the rack is non-coated). Place strips of bacon on the wire rack. Brush the bacon with the maple syrup (reserving half). Sprinkle half of the brown sugar evenly across the tops of the bacon. Place in oven and bake for 20 minutes. Remove from oven, flip bacon over and cover with the remaining syrup and brown sugar. Place in oven for an additional 15 minutes. Remove from pan as soon as it is cool enough to touch. Do not wait too long or it will stick. Using a small saucepan over low-medium heat, melt the duck fat and combine with the Worcestershire, smoked salt, garlic powder, onion powder, black pepper, and cayenne pepper. Once combined, remove from heat. 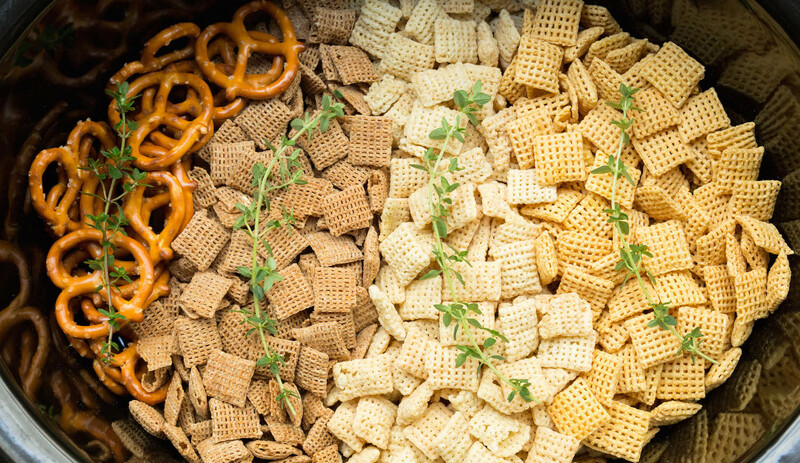 Add all of the chex & pretzels to your crock pot. Drizzle the duck fat mixture over the top. Gently toss. Place thyme sprigs on top. Turn the crock pot on low for 3 hours. I gave it a stir every 45-60 minutes to keep the bottom from burning. When done, remove from crock pot and lay in a single layer on parchment paper until it is cool. 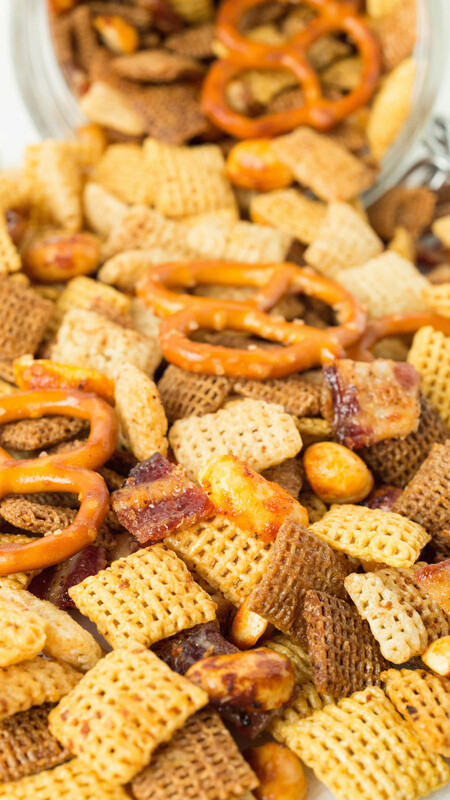 Combine cooled chex mix with Sriracha peanuts and candied bacon. Serve immediately or store in an airtight container. Just printed this off for my hubby. My husband’s family are all huge Chex Mix fans. Me? Meh. However, giving this to him to make the next time he’s doing Chex Mix because this really sounds amazing! Duck fat rules and yes, we have some in the freezer! I hope you enjoy it, Carol! Please let me know how it goes. surprisingly, they turned out to be so yummy and crispy, I threw a party and everyone loved it,asked me the recipe but no, no , its my secret, ha ha !